“This extraordinary tête-à-tête is just one example of how the war over Common Core has personally engaged—and bedeviled—some of America’s most powerful business leaders. Hugely controversial, it has thrust executives into the uncomfortable intersection of business and politics. This is what many of us have been saying for some time: these standards are backed, and were initiated, by business. They admit as much, finally, in this article. Not mentioned is how a few businesses stand to gain from the sales of curriculum designed to teach to the standards, nor how much the testing industry is making delivering the tests of the standards. But let’s leave that for another time. This article contains even more disturbing ideas about how our children should be used as profit making fodder. Those ideas come from Rex Tillerson, CEO of Exxon Mobil. Tillerson apparently agrees with Gates and, as the Education Chair of the Business Roundtable, has been supporting and promoting the Common Core. And Tillerson, like Gates, reveals a lot about how he views our children when he speaks. 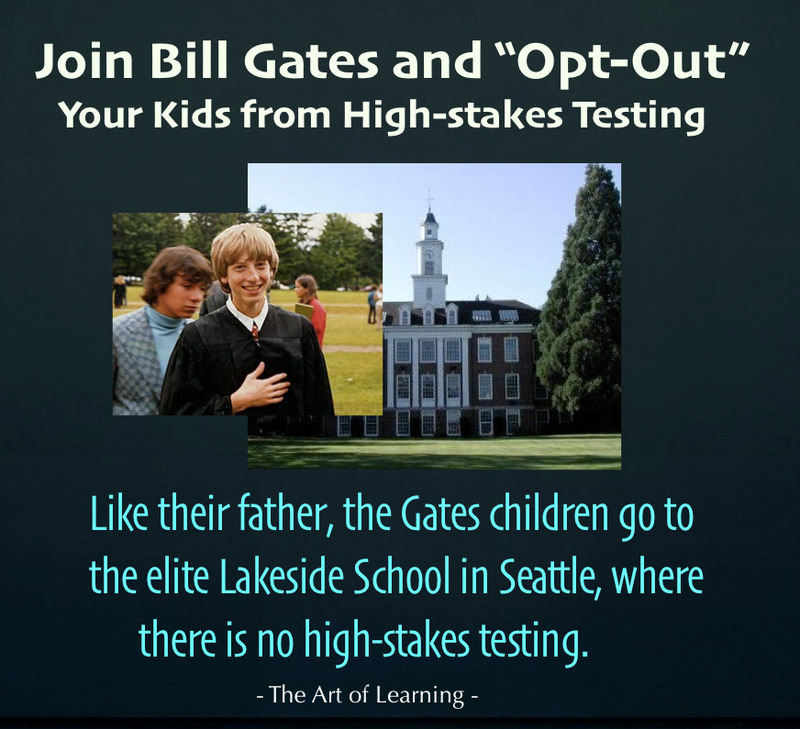 While Gates speaks of education as a process that is easily measured and needs to be standardized like any manufacturing process, Tillerson goes even further and speaks of our children as the product of that process: one to be consumed by Exxon Mobil and the rest of corporate America. That’s right. Children, human beings, are “defective products”. According to Tillerson, our job as parents is not to raise healthy, happy people. As teachers, our job is not to assist parents in that endeavor. It is all of our jobs to assure that corporate America has access to non-defective products, ready for their consumption. Sorry, but this doesn’t inspire belief that they only want what’s best for our “defective products”. I believe what they want is to have the “defective products” sorted from the “superior products” via a system of scoring children 1 through 4, a scoring system that has been promoted around the country. Check your kid’s SBAC or PARCC scores and see. The thing is, when we sort human beings on any basis, it often looks something like this. Of course the losers in this deal will be kids, the “defective products”. Because the “consumers” want them sorted early. After all, they backwards planned all these standards, to be measured incrementally, like all production processes. Never mind that children don’t develop in a linear fashion like that. Never mind that some children have extra challenges to overcome and need extra time. Never mind that there is great disagreement over how the bell curve relates to human intelligence and how nature vs. nurture affects one's landing spot on the curve over time. Never mind that some have used this normal probability distribution to justify elitist, racist, sexist, exclusionary policies. Never mind. The very narrow focus of the Common Core and its tests on discreet English and Math skills will quickly and easily reveal to Exxon and other “consumers” in the “cradle to career” system exactly where our kids fit into their business plan. No need to waste any money on the arts or music or drama or physical education or any of that silly stuff, either. They won’t need that down at the office … or factory … depending on where the cradle to career ranking places them. Gee, I wonder if there’s any way those rankings could ever affect access to student financial aid and college? Of course, it won’t affect access to college for anyone with the ability to pay and avoid the ranking system. And speaking of college, EVEN IF every kid in America were a highly educated college graduate, would industry have a high paying job waiting for all of them? One that would make it worth incurring often massive student loan debt? Or is all this sorting really designed to prepare most of our kids to accept jobs at the kinds of wages people are currently paid in countries where the citizenry, due to inadequate access to resources including education, is more easily exploited? Let's be honest: this isn’t about struggling to find American employees with adequate preparation. It’s about lowering corporate costs. Including their tax burden. Judging by recent revelations regarding Exxon’s involvement in repressing information about climate change, reminiscent of Big Tobacco’s insistence for decades that smoking was not a health risk, Exxon and other large corporations can’t always be trusted to act in the public’s best interest. The bottom line is their bottom line. They don’t care about our kids. Or any of us. At all.